A couple of years ago Melbourne caught onto the Freakshake craze. Cafes all over the city to the 'burbs began serving up decadent milkshakes on sugary steriods to excited children and kidaults alike. 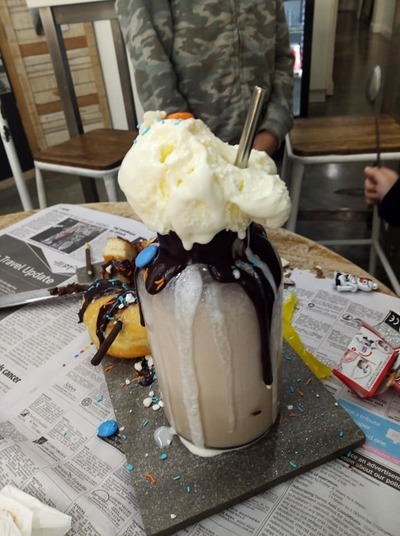 The trend continues to flourish, at least at The Cake Cottage in Frankston who were one of the first to embrace the Monstershake movement in Melbourne. The Freakshakes in Funkytown have expoded in more ways than one. The Cake Cottage now serve up 22 different varieties of Freakshakes to sugar-loving Melburnians. Like a thickshake on steroids, Freakshakes are served with a giant jar filled with flavoured milk, topped with cream, ice-cream, lollies, donuts, chocolate, sprinkles, nutella, cookies, and just about any other edible treat you can think of. 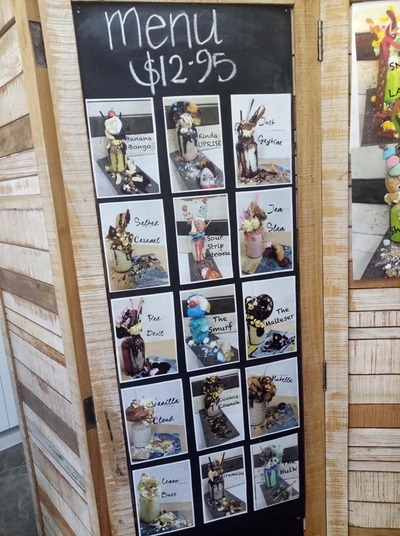 Such variations of Freakshakes at The Cake Cottage include but are not limited to: "Snakes and Ladders", "The Malteser", "Kinda Surprise", "Shopkins", "Salted Caramel", "Vanilla Cloud", "Nutella" and "The Hulk". With so many Freakshakes to choose from, how will your kid decide? Let's just say it's a tricky one. You might need to suggest one or two varieties otherwise you could be there all day! With a little help, these two picked a "Snakes and Ladders" and a "Kinda Suprise". Will your children finish their Freakshakes at The Cake Cottage? There's a lot to get through so possibly not, but your sweet-toothed kids have the option of taking home any leftover toppings in a paper bag to eat later. Otherwise why not share the sugary load with your child? If they let you! Freakshakes at The Cake Cottage are priced at $12.95. 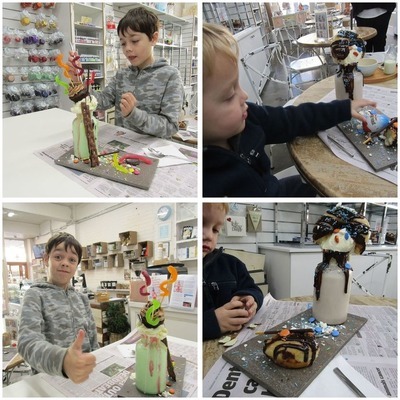 Side note: this cake and coffee shop in Wells Road Frankston offers cake decorating workshops for children & adults and can craft you a cake for any special occasion. Keep up to date with the lastest news from The Cake Cottage on the following Facebook Page. Side note: the reusable sustainable steel straws seen in the images here are our own. They are from Straw and Boo; we take our straws with us wherever we go.